2016 was a turbulent year to be an American urbanite. Abhorrent headlines featuring the political shifts, injustices, and the inequities of our time reigned supreme in the media, real or otherwise. Portland had fared the storm better than most cities, but still faced a good deal of its own challenges. As far as the built environment was concerned, apartment and home prices had caught most of the media’s attention, having regained most, if not all, of their lost growth from the aftermath of the recession. The rise in rents and home value gains did occur at a faster pace than many long-term residents would have liked, but Portland’s market has been undervalued for decades and it was only a matter of time before word got out about this special little corner of the world. The rapid influx of new apartments and infill housing that followed this recent spike in demand brought with it the density needed to support the envisioned ’20-minute neighborhoods’ that have been long sought after by activists and politicians alike. Now, at the beginning of this new year, the market has started to shift slightly away from multi-family housing and more toward office, mixed-use, and other commercial interests. Last year’s relatively high volume of new residential units finally started to stabilize rental prices after years of pent-up demand. This is not to say that Portland was alone in this kind of development boom, as other West Coast cities experienced even larger gains than the Rose City in both residential and commercial markets. As an example, we can look north toward Seattle, where that city saw 15,000 new residents and 5.7 million square feet of new downtown office construction in 2016 alone (for local reference, that’s 1/3 of the Portland skyline’s existing office space). Regardless, Portland, like all of its Pacific counterparts, saw great changes to its urban fabric in 2016, and as always some additions were better than others. As far as small scale architecture goes, you can not get much smaller than an 8’x12’ by 10’8″ box that is designed to house someone, but the Center for Public Interest Design saw immense potential for said boxes in the current housing crisis. 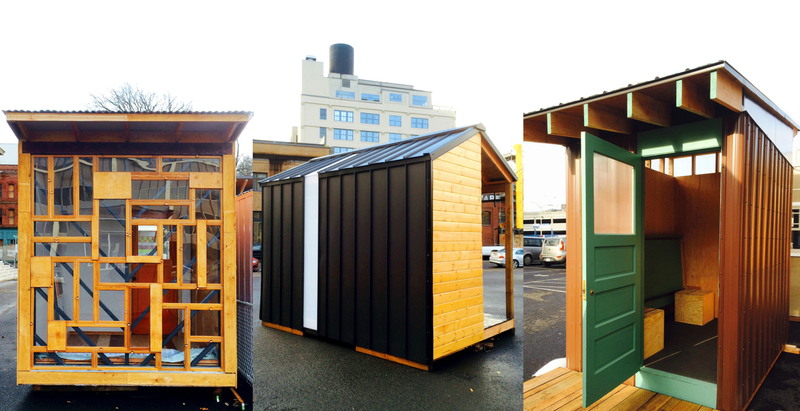 Known as ‘sleeping pods,’ these little structures tend to be built out of scraps and donations, and often become the single family residences in compact vernacular villages created for and by the homeless in Portland. They have worked surprisingly well at creating semi-permanent communities that often lead to much safer and cleaner environments for the city’s destitute than simply being on the streets. The CPID, focusing at home instead of abroad, wanted to bring awareness of such informal villages by organizing the design community to build a series of these pods as a demonstration of how they can help mitigate some of the worst effects of the housing crisis. The POD Initiative ended up building 14 micro-houses with volunteers teams from SERA Architects, Holst Architecture, Mackenzie, SRG Partnership, Scott Edwards Architecture, MoMaMa, Communitecture, LRS Architects, Mods PDX & Shelter Wise, Architects Without Borders-OR, City Repair, two from CPID & PSU School of Architecture, and one from CPID & Neighborhood Works Realty. After a series of outreach events and homeless community charrettes, each team focused on different issues for their design strategy; some worked on using sustainable or recycled materials, while others worked on specific disadvantages or family situations. All in all, each pod was successful in their own right, but the real test will come this year as they will head to a site in the Kenton Neighborhood to become the first tiny houses in a new pilot village operated by Catholic Charities and the Joint Office of Homeless Services. The Center for Public Interest Design has long been an advocate for connecting architects and designers to their communities. The AIA, the American Institute of Architects, have long viewed public service as being an integral part of the profession, and the CPID was formed to make that gesture more of a reality for professionals and students here in Portland and elsewhere. The CPID has built projects as far away as Haiti, China, and Argentina, as well as places closer to home in Gresham and in several Portland neighborhoods. The POD Initiative was a culmination of the CPID’s expertise and experience in both community outreach and low cost/ high design, and brought those skills to good work for the city’s most vulnerable citizens. Everyone involved did an amazing job, and all of the collaborators deserve credit for their achievement. There were numerous low and mid-rise buildings completed in 2016 that deserve the limelight, but Lever Architecture’s Albina Yard truly deserves the recognition. This 16,000 SF mixed-use building, which is Lever’s new home, deserves praise for two major achievements; one, the building was the first commercial project to use D.R. Johnson’s Cross-Laminated Timber, and two, the design team used this new material technology without it hindering the firm’s creative process. CLT is one of many new forest products that have been created over the last decade that allow for mid to highrise construction to be built out of wood instead of steel and concrete. This is especially significant as the wood in CLT and similar products are less energy intensive to produce, are made from rapidly renewable trees, sequesters CO2, and are a boost for Oregon’s long-waning timber industry. 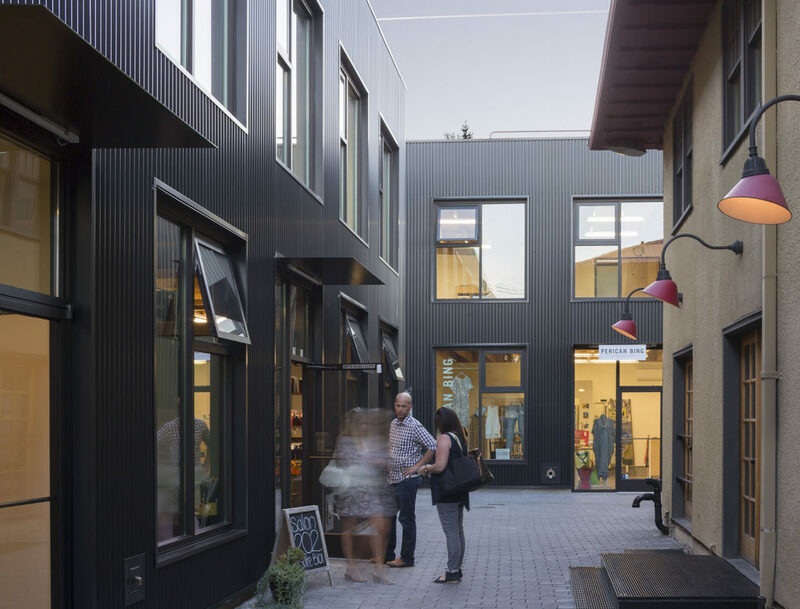 While CLT is a great structural element, many in the design community have questioned its utility in creative design, noting how its monolithic nature is not exactly finish carpentry, and this is why Albina Yard deserves praise for more than just being the first to do it in Portland. Lever utilized the rawness of CLT for its floor plates, creating a wood grain datum overhead, while using mass timber posts and beams as a giant Tinkertoy set that bears no illusions to how it’s constructed. The design team also used mass timber as the structural guardrail for their grand staircase, further showcasing this new technology. This project, of course, was the testing ground for the firm’s next adventure in heavy timber construction, Lever’s 12-story Framework building proposed for the Pearl. It is there that the architects hope to push all wood construction to even greater heights. 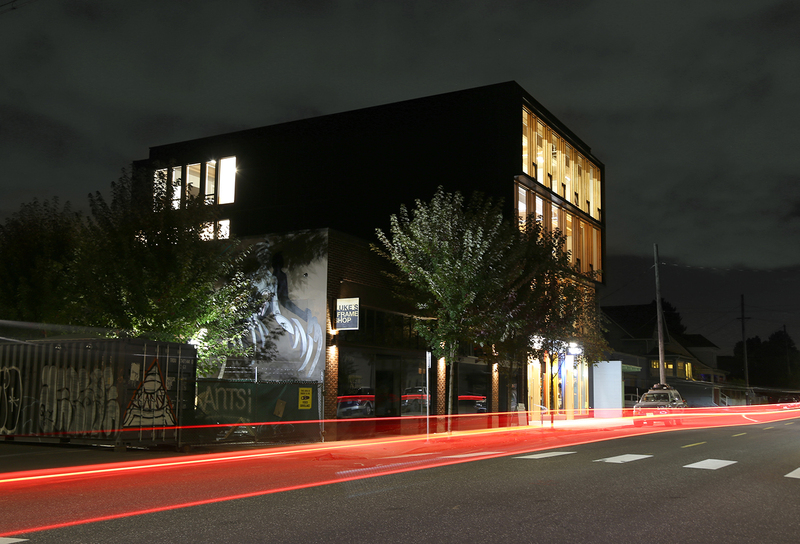 Regardless of what it’s built of, Albina Yard is also a very well-designed building, contemporary yet restrained. This welcome addition to Portland’s urban fabric nestles itself cozily between its single-story commercial neighbors along the busier Albina Avenue, while simultaneously being courteous to the single-family homes on its backside. The four-story structure’s street-facing facade is somewhat reminiscent of the old commercial storefront across Blandena Street, but its framed fenestration focuses the interior program forward in a series of subtle shifts in directional plane. The rear erodes itself from its pure form frontage, unveiling staggered windows along setbacks and understated deviations in material variation. The building also opens up to the south, creating an alley of sorts with its neighbors, which gives the new structure an older urban feel without overpowering its surroundings. There were not as many larger scale projects that came online in 2016 that deserve special recognition, but the Pearl West office building from Hacker and GBD Architects is a very elegant addition to the city’s urban core that arrived early on in the first few months of the year. The building itself can be easily missed, glossed over for its flashier or more expressive neighbors in the Pearl, but it is that subtlety which makes it unique and gives it strength. Pushed up against the uprising of the 405 freeway, this 240,000 SF half-block mid-rise first appears as a placid relic of the area’s industrial past, but upon further inspection the building soars with its dignified refinement of classical forms and its reverence for tactile materiality. The design architect’s biggest move for this 9-story office block was to begin with a heavy base, a reference to the masonry construction techniques of its older brick counterparts, and then slowly open up the facade with ever-expanding punched windows as the tower rises into the sky above. The effect is a gradual dissipation of stoic solidity into the atmosphere, much like the much-hyped renderings of Skylab’s Yard which came up short on its high-profile promise later that same year. 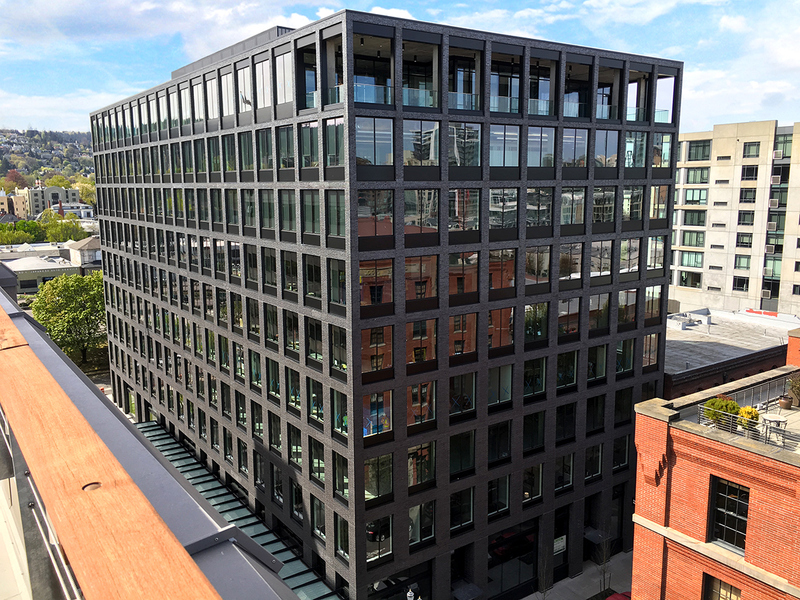 The mass of the structure is clad in irregular textured, slate black brick that has a glazed appearance that changes hues throughout the day, which helps obscure the discreet changes in fenestration. The ascending framework is further eroded with a top floor loggia that faces east, a move that stays true to the building’s form, yet subtly breaks the monotony of the symmetrical Portland slab. Pearl West is not a whimsical adventure in pushing architecture’s vast boundaries, no, it is a culmination of longstanding architectural traditions made manifest for this time and place. There is a stable elegance to the building’s repetitions and redacted nature, its reliance on time-honored proportions rather than the gimmicks of current fashion. Sometimes, grand architecture does not require one to reinvent the wheel, as the wheel serves its function quite well as it is, rather it is the people who craft it, their individual artistic marks, that separate the greater works from the lesser ones. However, there is always a fine line between historic mimicry and the reinvention of architectural traditions, and while the former is quite difficult to pull off respectfully the latter tends to be even more of an onerous challenge to even the most seasoned professional. The design team deserves credit for creating an excellent fabric building, a building that will remain pertinent for decades to come. For the second year in a row, 2016’s best urban design is not a piece of civic or landscape architecture, as once again that honor goes to a small commercial project: the Milwaukie Way from Waechter Architecture. Like most great architecture, images do not do it justice, for this L-shaped pedestrian alley is much more than the juxtaposition of the colorful 1929 spanish colonial building to the new, contemporary black box that wraps it on two sides. The existing infrastructure, topographical challenges, and other idiosyncrasies between the two structures became assets, assets that are incredibly difficult to produce with all new construction. Simple details such as hand-set pavers, thin-profile awnings, and custom-welded railings all contribute to the harmony of the pedestrian’s experience, whether one is simply meandering through or there to frequent one of the side street’s multitude of locally-based merchants. The real beauty is in its simplicity. Just like the Pearl West building, Milwaukie Way is clad in a uniform material with planar surfaces and inset fenestration. Here though, the masses of the two new structures are subservient to the old, as is the dark color of the textured metal panelling. The high contrast between them is not only respectful, but also works to blend the disparate architectures in a convincing way without having to fall into the pitfalls of historic mimicry. There are also several small moments, view angles and transitions as one traverses the alleyway, that make each retail space unique and worth noting despite the seemingly monolithic form of the overall building. All of these components were designed to slow one down to a strolling pace, unforced and enjoyable. All in all, the Milwaukie Way is a great little project that adds a welcome side note to the already lively mix of shops and restaurants at the center of Westmoreland. Hopefully, the greenway at the center of the Claybourne Commons project currently being constructed behind Milwaukie Way gets incorporated into the alley experience, but the current plans show it being closed off, which would be a lost opportunity if it were to become reality. The open juncture between the ‘L’ of the two new buildings does allow for a future connection to the aforementioned residential project or to the surface parking lot next door if it ever gets redeveloped, either connection could be mutually beneficial if designed appropriately. Regardless, the new pedestrian alley works very well as it stands, and is absolutely worth checking out on one’s own. Any insight to whether the new condo market will return any time soon? Condo construction is a tricky enterprise in Portland. The city currently has relatively high labor and land costs, which makes condo construction only pencil out for luxury units. Once completed, the market can only absorb high-end units at a snail’s pace without there being an investment focus that creates speculative demand (and we all know how that turned out in 2007). Developers and banks see condos as high risk for a multitude of reasons, especially the unpredictable nature of a two year +/- construction schedule. There is also a litigation industry based on condo construction, which makes most contractors and architects see them as a dangerous liability, as both are susceptible to lawsuits for 10 years past substantial completion. That said, the condo market may return faster than we think due to the potential for a glut in apartment building. Condo conversions are a common practice when market demands shift, so expect some apartment projects that are already underway to shift gears if the rents continue to plateau or start going down. Many of the local apartment builders are in it for the long haul however, and have taken into account the potential for market shifts, like UD+P (Slate), while others build and sell to outside money as quickly as they can to avoid risk, like Key Development (Yard). Regardless, there won’t be very much new condo construction in the Portland area for years to come, but some mid-construction conversions could occur if there were to be a major shift in the market. I recently was pointed towards your insightful blog. Thank you for taking the time to look closely at the work that is shaping our very young city….